The latest rankings from U.S. News & World Report put Rice University at 19th, the University of Texas at Austin at 53rd and Texas A&M University at 68th. Texas universities saw little change in their position in this year’s rankings. Despite falling a spot in this year’s U.S. News & World Report college rankings, Rice University remained the only Texas university to crack the top 20. Texas universities saw little change in their position in the influential and controversial rankings of the country’s colleges and universities. The list was released on Tuesday. The University of Texas at Austin and Rice University both dropped by a single ranking, to 53 and 19 respectively, while Texas A&M University went up by one rank to 68. Southern Methodist University went from 60 last year to 58 on the new list. Last year witnessed a more dramatic shakeup, with UT-Austin dropping six spots and Texas A&M falling four. The top institutions on U.S. News' list are private, with Princeton, Harvard and Yale claiming the first three spots. While university officials praised their schools’ high standings, they also were hesitant to put too much stock into the annual rankings. "I take them with a grain of salt but that's different than saying we ought not care about them," UT-Austin President William Powers Jr. said. He said it is difficult for large, public universities to perform as well as other schools on the U.S. News rankings because the list takes into account factors outside a university’s immediate control, including SAT scores. “Three-quarters of our class is admitted without regard to SAT scores, so it is not surprising we don't do quite as well in that," Powers said. U.S. News measures universities based on graduation rates, faculty resources, student selectivity and alumni giving, among other factors. It is one of a growing number of university rankings. The New York Times revealed a new index Monday evening that ranks universities based on enrollment and support of underprivileged students. The Times' index only ranks universities with a four-year graduation rate of 75 percent or higher, excluding many Texas institutions from consideration. At 11th, Rice University just missed out on cracking the top ten. Results among ranking systems differ, sometimes drastically. Recently the Times Higher Education World Reputation Rankings put UT-Austin at 33 in the world, while Rice University, Texas A&M and Southern Methodist University did not crack the top 100. But in the Washington Monthly college rankings, Texas A&M sits at third best in the country, with UT-El Paso at seventh and UT-Austin at 18th. Money magazine, which is new to the game of college rankings, focuses prominently on college students' debt and other financial issues. 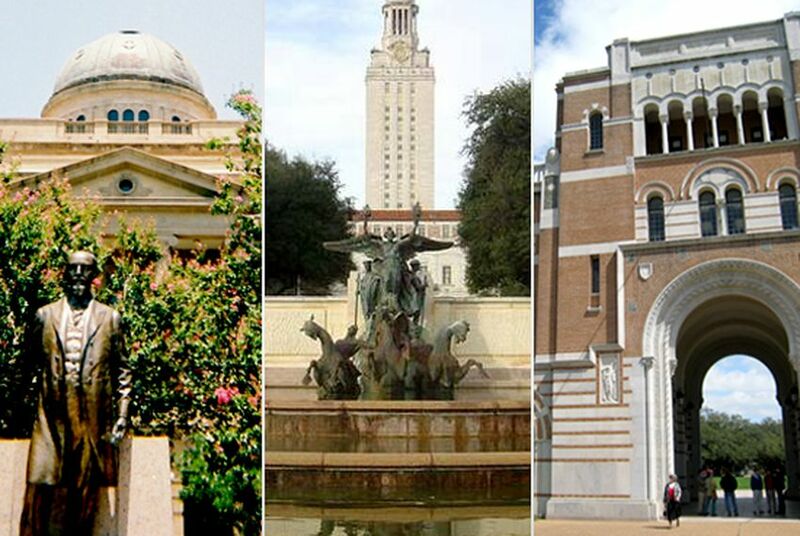 Money ranked Rice University at 20th, Texas A&M at 24th and UT-Austin at 53rd. Southern Methodist University was 257th. Kim Clark, a senior writer for Time who helped put together Money's rankings, said different ranking systems vary in purpose. Clark said she hopes students who are considering taking out debt use the Money rankings. She said ranking systems like U.S. News' and others offer transparency for students. Disclosure: The University of Texas at Austin, Texas A&M University, Southern Methodist University, the University of Texas at El Paso and Rice University have been corporate sponsors of The Texas Tribune. A complete list of Texas Tribune donors and sponsors can be viewed here. *Correction: A previous version of this story included incorrect information about Southern Methodist University's rating last year. Also, this story has been updated to include additional context of a quote from UT-Austin President William Powers Jr.